Conch Republic Cup, Key West to Cuba, Jan. 26-Feb. 3 The Conch Republic Cup race is scheduled to depart from Key West on Jan. 27 and return by Feb. 3. Events will begin with registration at the Race Village in Key West on Jan. 26, with a skipper’s meeting at 6pm and welcome party at 7pm. The race will go to Marina Heingway with a 7pm welcome party on Jan. 28 at the Hemingway International Yacht Club. On Jan. 31, at 12pm, will be the Torreon de la Chorrera Buoy Race off Havana, with an awards party that evening at the yacht club. The return race will start on Feb. 2 at 12pm for the race back to Key West, with a 7pm awards party on Feb. 3. Registration deadline is Dec. 31. For more information, including the updated Notice of Race and full schedule, go to www.conchrepubliccup.org, or email karen@conchrepubliccup.org. 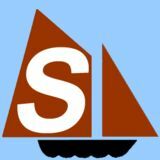 Gasparilla Regatta, Tampa Sailing Squadron, Tampa, FL, Feb. 10 Tampa Sailing Squadron’s Gasparilla Regatta is the hot ticket for your February racing fix! On Saturday, Feb. 10, there will be Spinnaker, Non-spinnaker, Racer Cruiser, Cruising and Motherload classes competing on Tampa Bay. Also, “NEW” is a Doublehand class that races around our long course! Our recent dredging of the main channel has been very popular and this is the only regatta in Tampa Bay where you will be fed a hot breakfast before racing. Following racing is our infamous party, with live music by the Scallywags of BCYC, rum libations and an awards dinner. Pre-race skippers meeting is Friday, Feb. 9, at 5pm, featuring a beer keg and $5 hamburger/hotdog dinners. For additional information contact Matt Dalton at tssregatta@gmail.com. For NOR and a discount for early registration, go to www.sail-tss.org. 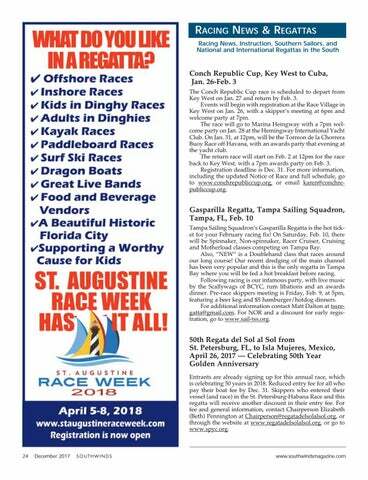 50th Regata del Sol al Sol from St. Petersburg, FL, to Isla Mujeres, Mexico, April 26, 2017 — Celebrating 50th Year Golden Anniversary Entrants are already signing up for this annual race, which is celebrating 50 years in 2018. Reduced entry fee for all who pay their boat fee by Dec. 31. Skippers who entered their vessel (and race) in the St. Petersburg-Habana Race and this regatta will receive another discount in their entry fee. For fee and general information, contact Chairperson Elizabeth (Beth) Pennington at Chairperson@regatadelsolalsol.org, or through the website at www.regatadelsolalsol.org, or go to www.spyc.org.